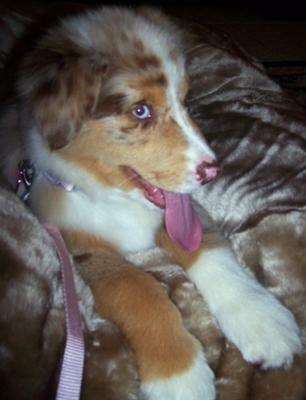 Aussie Summer Sky - is the newest member of the family. She found us and she has changed our lives. We have a big family (six children) and a very active/loud life with lots of fun and joy. That's a lot for any puppy to take in but Summer... well she took it all in stride fitting right in. She has filled the hole in our hearts and has made this big house... a better place to live. I don't have children but the neighbor kids ring my doorbell to see if Scooter can come out and play frisbee. If he hears them down the street he will bark a half bark so they know he's out front.